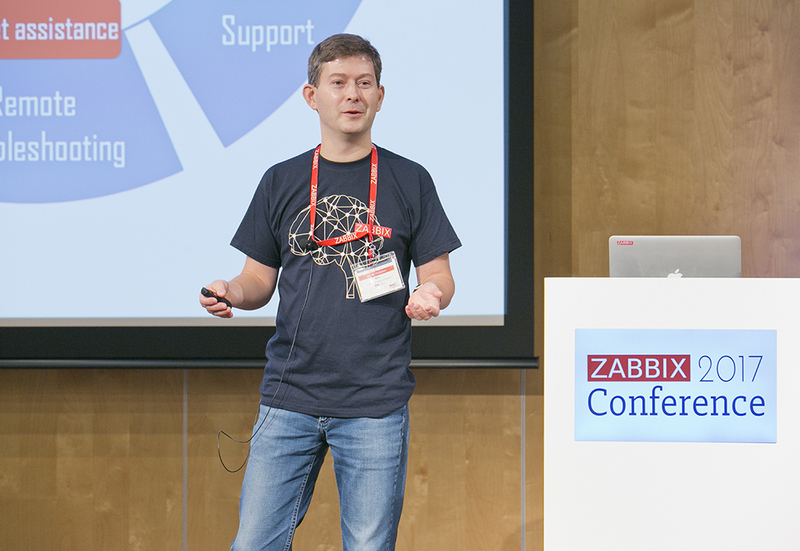 According to tradition, the conference was opened by Alexei Vladishev, giving an overall insight into the conference statistics as well as the latest Zabbix accomplishments and what future holds for next Zabbix releases. The main focus of the keynote was put on event correlation, IT services and performance improvements, more out of the box monitoring and significantly smaller gaps between releases in future. Can you imagine which country is in the first place in terms of participants having come this year? Well you can find this info in Alexei’s keynote as well. Postgres with pgbouncer to reduce number of connections to DB, but will migrate to Oracle (since there are much more Oracle DBAs in SAS company so it’s easier to find an Expert inside SAS). LDAP integration is done via Zabbix API. Synthetic transactions are used to check services. When developers don’t want to spend time configuring a monitoring system, and operations don’t have time to learn all the details around systems using the IT infrastructure, they have to talk to each other to find out how to get a system that does the dirty work for them. Devops environments can deliver results in an efficient way, but they depend on a high level of automation to reach the goals. Rafael Martinez Guerrero spoke about systems used in their DevOps environment where Zabbix is an important part. Modern environments require powerful Inventory and Configuration management solutions such as Nivlheim development in University of Oslo, and CFEngine. Ingus Vilnis: You still don’t know what’s new in 3.4? 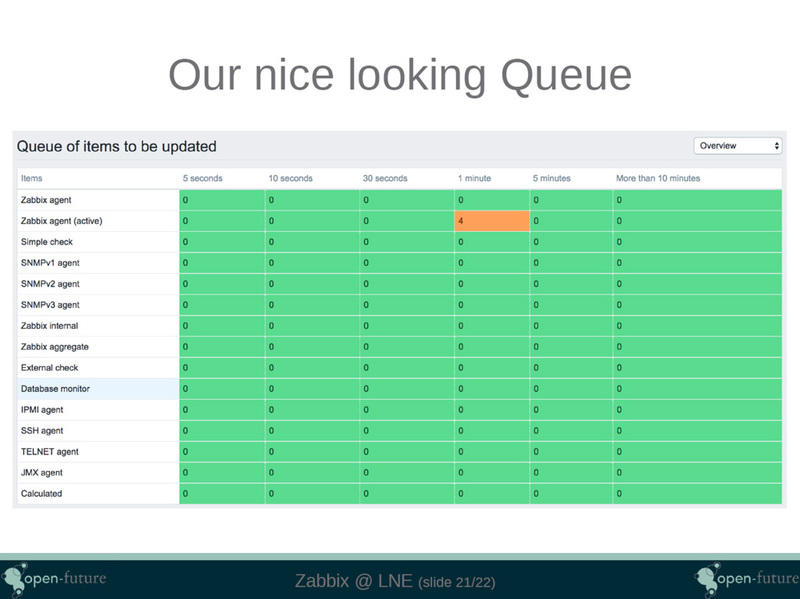 Ingus introduced all the shiny new features of freshly released Zabbix 3.4. With all his rich experience running Zabbix webinars, workshops and training, Ingus demonstrated the growth of Zabbix functionality, highlighting benefits and mentioning real-life scenarios how to get the most out of new things. Andrew gave an insight into how provisioning tools such as Ansible complement Zabbix and provide the missing piece of easy-to-use deployment of Zabbix agents and more. In addition, with Ansible Tower (now on github in a form of open-source version https://github.com/ansible/awx), using Ansible with Zabbix becomes even more easier! Vladimir started with a course ‘for Dummies’ explaining the modern cloud technologies. And then he switched to a guide on how Zabbix can be deployed in clouds. Which architectures are better for Zabbix in the clouds? There are at least few good solutions given by Vladimir. Find them in his speech! Gabriel revealed a secret what drives big telecom companies to switch from traditional enterprise commercial level monitoring tools. Of course, licensing costs. Or as he calls them “License Jail”. 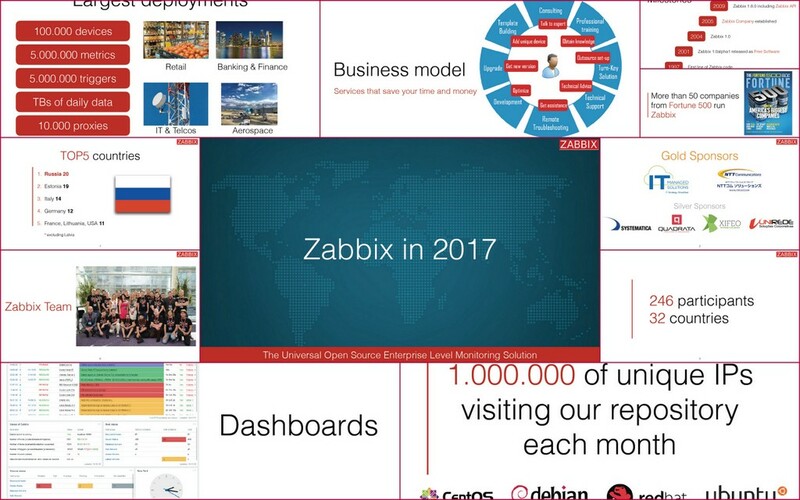 What made him choose Zabbix among open source solutions? Rumors! 😉 And their Slovak partners’ experience with any sort of projects. Gabriel praises Zabbix Fault Management, Performance Management, SLA, Inventory and Web monitoring and other pros. 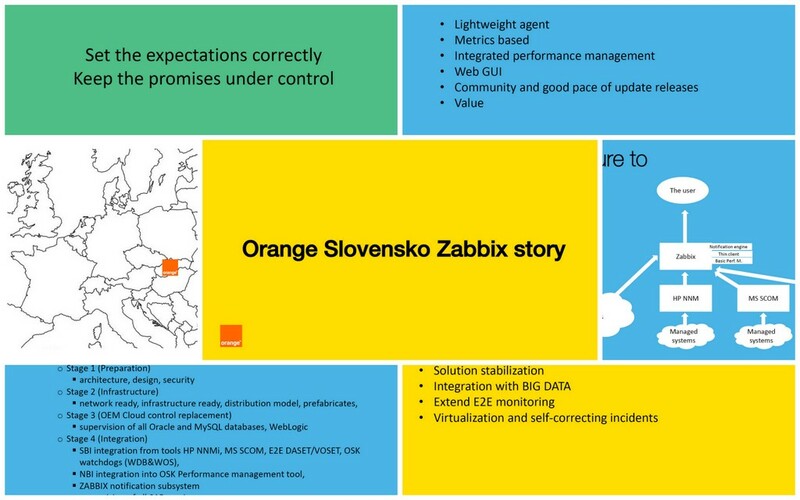 In his presentation, you’ll find how Orange Slovensko planned their migration, how it worked out, and what they plan to do next. Chris provided one more example how well-known enterprises benefit from starting using open-source solutions like Zabbix. Accompanied with Grafana, Victor Ops and ServiceNow, IT Managed Solutions effectively provided the customer with powerful monitoring solution. A Zabbix client, Rietumu Banka system analyst, Constantin Oshmyan spoke about why they choose Zabbix over IBM monitoring solutions (for its simplicity, SLA support and local and friendly technical support) and how they monitor IBM technological stack in their banking IT infrastructure. With native support for AS/400 systems missing, Constantin implemented Zabbix agent himself for this OS, using Zabbix agent protocol. You can download his solution at share.zabbix.com. 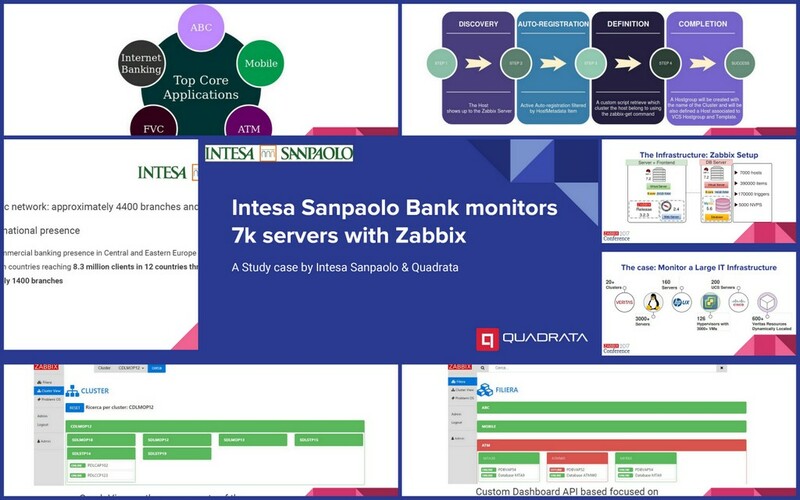 Yet another case study about monitoring large IT infrastructure, now in major Italian banks. Francesco and Pietro shared their knowledge on how enterprise technologies like Veritas clusters can be successfully monitored with Zabbix and how they developed a high level customized dashboard on top of the Zabbix solution and why. 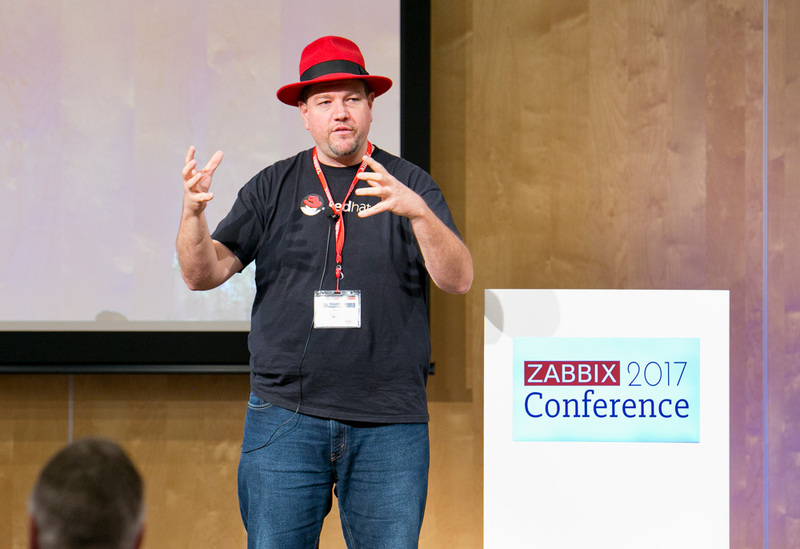 Patrik spoke about automating things in Zabbix at a maximum level and challenges he faced. And how he and his team solved them, using proper hardware and software setup as well as using Smart templates, automation scripts, Grafana, LLD discovery (feature they asked Zabbix to develop and so we did), and more. Any industry would benefit and require a good monitoring solution, and luxury fashion Yoox Net-A-Porter Group is not an exception. Monitoring administrators of Yoox explained in expressive language how to monitor e-commerce business with Zabbix that hosted on AWS. While there are no words to fully describe the emotions of the Italian speakers (the videos will arrive a bit later), try to imagine their delivery by skimming through their slides. Click here for the highlights of Day 2! And enjoy the moments in our Photo Gallery!